MCPS does not consider journalism a technology course. Our website begs to differ. Students who want to study journalism want credit for taking a class that gives them experience in the field. However, Montgomery County Public Schools does not consider journalism eligible for a technology credit. In introductory journalism, students are given the option to apply their positions prior to joining the newspaper class, increasing their engagement. In addition to libel and censorship law, the introductory class teaches students all the elements of conducting interviews, basic grammar, concise writing, and writing news stories. In the advanced class, students learn desktop publishing using the WordPress platform, which powers about 31 percent of the internet. They practice designing graphics, creating websites, and managing them, all of which are useful skills in many other fields. “By the time students leave my class, they are able to not only publish their writing on a WordPress site, but also able to design and edit a WordPress site, and do some basic coding as well,” journalism teacher and Current adviser Sara Confino said. This type of real-world applicable technology is far more useful in students’ futures than many of the classes that MCPS certifies for technology credits. 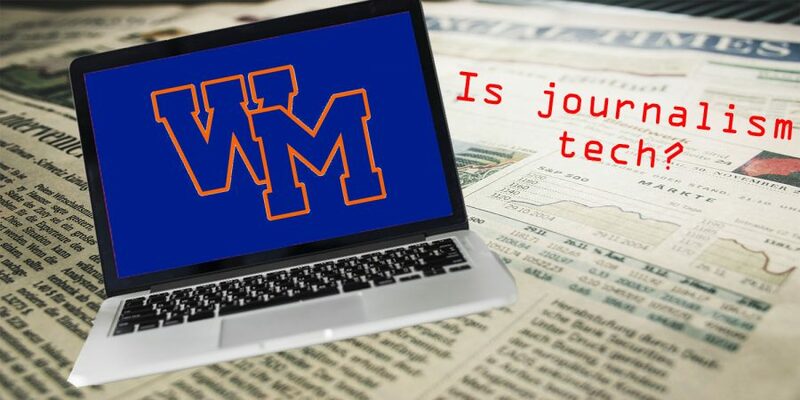 Print journalism may be struggling, but online journalism is alive and well, and the advanced journalism class at Watkins Mill prepares students for the technological realm that journalism has moved toward. Students are also responsible for the social media accounts and learn how to use WordPress plugins to create quizzes, slideshows, and other multimedia platforms. “Journalism helped me improve in other classes because we get to use computers a lot and we learn how to edit articles,” senior advanced journalism student Aisha Sowe said. While the introductory course is focused on literacy skills, it also incorporates many aspects of digital media production, and the advanced class takes it a step further when students actually run the website, which publishes daily. Journalism should therefore be acknowledged as a technology credit in MCPS to reward students for the learning that they have already achieved in technology. The course doesn’t just give students a reason to stay informed about their surroundings and current events and perfect their writing; it helps kids learn a valuable element of modern technology that will be important in any internet-based field that they pursue in college and beyond.